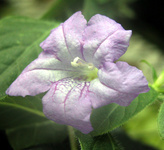 Ruellia inundata H. B. K.
Note: this taxon list is still under construction. 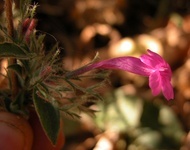 It does not yet contain all known Ruellia inundata clade subgroups. Species in the Ruellia inundata clade exhibit a disjunct distribution: some occur in Mexico and Central America, while others occur in Brazil and Ecuador. All inhabit forests or habitats that experience seasonality, i. e., a dry season. Some species in this clade are characterized by having clavate fruits with external, maroon splotches. Many have a very pungent, vegetative odor. This clade is well supported by molecular data (Tripp, in press), and provides an excellent example of the floral diversity that is seen even between very closely related species in Ruellia.